Not sure which Dermaceutic product is for you? Dr Alek Nikolic discusses the brand Dermaceutic, what they stand for and who they are. A brief outline of each product in the Dermaceutic range is also discussed to make it easier in picking the right product for your skin. Dermaceutic is a leading international skincare brand used and endorsed by over 30,000 doctors and aestheticians around the world. Developed in France in the 1990s by doctors seeking to provide patients with effective, non-invasive skincare options, Dermaceutic offers innovative peels and cosmeceuticals whose results are backed by one of the most extensive clinical trials in the industry. The company’s products offer safe and effective solutions for every skin type through targeted chemical peel treatments and cosmeceuticals which have been developed to combat most major skin conditions: dull complexion, acne, wrinkles and pigmentation. Dermaceutic was initially developed in France to meet the requirements for cosmetic doctors, aesthetic physicians, dermatologists and skin care specialists. This is the main reason Dermaceutic skin care products have been developed by a team of biochemists, dermatologists and aesthetic surgeons. The products aim to prepare, optimize, repair and extend the result of peeling, laser, fillers and cosmetic surgery. Dermaceutic was one of the first cosmeceutical companies to develop products using ingredients such as hyaluronic acid, stabilized vitamin C, and glycolic acid. As a result, Dermaceutic has become an industry leader in discovering effective combinations of ingredients for use in skin care and overall skin health. With their approach of using different chemical peels specific for different patient needs and combined with an at home skin regimen, optimal results can be achieved. The effectiveness of Dermaceutic’s topical skin care range and peel treatment protocols is supported by numerous clinical trials, and the company’s collaboration with industry-leading practitioners from around the globe. Dermaceutic currently offers two product lines: professional chemical peels and cosmeceuticals. They may be used independently or together as part of a customized skincare routine to achieve optimal lasting results with less irritation and downtime than other more concentrated peels. The skin is clean and hydrated; skin balance is restored. Foamer 5 and Foamer 15 (5 & 15 % glycolic acid respectively) is recommended for darker or more sensitive skin with dull complexion, irregular texture and skin imperfections. Mask 15 is recommended for oily skin, and skin that is prone to acne. Advanced Cleanser is recommended for all skin types, including sensitive and dehydrated skin. Light Ceutic is recommended for dull skin and irregular complexion. Contributes to skin radiance and evens out the complexion. Turn Over is recommended to treat loss of skin tone, wrinkles and fine lines. Regen Ceutic is recommended for sensitive, dehydrated and aging skin. K Ceutic helps reduce skin redness, post-aesthetic treatment. Hyal Ceutic provides essential nutrients to keep the skin hydrated all day and full of essential hyaluronic acid. Sun Ceutic 50: Anti-Aging Sun Cream provides high protection for skin exposed to UV rays and helps to prevent premature aging of skin. Antioxidant Day Cream: C25 Cream is recommended for irregular complexion and loss of radiance. Concentrated in antioxidants which contribute to prevent damage from free radicals. Activ Retinol 1.0 & Activ Retinol 0.5 (Vitamin A) is recommended to treat loss of skin tone, wrinkles, fine lines and dull complexion. Yellow Cream reduces dark spots and uneven skin tone. Pigmentation spots are less visible and overall complexion is harmonized. 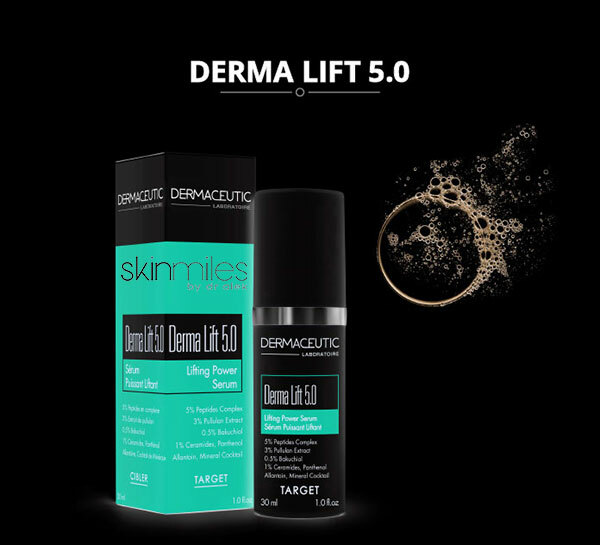 Derma Lift 5.0 is recommended for sagging skin, expression lines and fine wrinkles. Dermaceutic’s chemical peels and cosmeceuticals contain an unrivalled concentration of active ingredients, uniquely combined to optimize skincare results. The brand was one of the first skincare lines to introduce into its formulas many now-essential skincare ingredients, including hyaluronic acid, vitamin C complex, and glycolic acid and retinol. Equally as important are its protocols, which have been designed to maximize the benefits and safety of each product whilst ensuring a quick and easy application. Dermaceutic is the choice of doctors and aesthetic experts worldwide for efficient and non-invasive skincare solutions, through safe and easy protocols which ensure optimal results. The products do not simply treat conditions; they transform and revitalize, creating long-lasting changes resulting in clearer, healthier skin. I hope the above article has made it easier to understand all the products that can be found in the Dermaceutic range. I highly recommend trying this brand especially if you are not using a doctor prescribed skin acre regime. Please feel free to send me any questions or take our Face2Face Skin Consultation for a more personal recommendation.